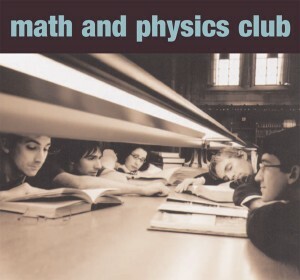 Highly anticipated debut album from indie darlings Math and Physics Club! The world fell in love with this Seattle band as soon as its debut 'Weekends Away' was released in 2005. The EP sold out of its initial pressing in just a few months and has now earned the distinction as the best selling single on Matinée. The follow-up 'Movie Ending Romance' was released later that year to worldwide acclaim and proved the success of the debut was no happy accident. The band spent the past year writing and recording its debut album and the results are truly spectacular. The self-titled album features ten highly melodic songs about relationships and heartbreak. From the first moment of the opening track you know you're in for a treat and it doesn't let up until the final note some 30 minutes later. The album kicks off with a new indie classic called 'Darling, Please Come Home.' The lyrics draw you in immediately with images of fireflies and coals burning low, while the jangling guitars, precise drumming, and keyboards keep things moving. What would normally be a difficult one to follow for most bands is handled with ease by second track 'I Know What I Want,' a strings-laden jangler that builds to a superb Softies-inspired finish. It swings! 'April Showers' comes next and shows that here's a band that holds the Housemartins in the high regard they deserve. A sweet valentine written staring out the window at the rain (of course...this is Seattle), it recalls the brilliance of the famous Hull act with its ba-ba-ba's and jaunty melodies. 'Holidays and Saturdays' is the moody one of the bunch, showcasing plaintive lyrics and some violin to match, while 'La La La Lisa' picks it back up with the story of a high school crush on a girl with a bass guitar that is made especially grand with some genuinely inspired trumpet parts. 'Look At Us Now' is perfect café music with its sparse bossa nova beat, ba-ba-ba's, and violin…perhaps the best Style Council song Paul Weller never wrote? 'You'll Miss Me' is classic Math and Physics Club with a surprise rollicking piano in the second chorus, while 'Cold As Minnesota' has a bit of Motown/Supremes flavor to it—full of tambourine, handclaps, organ and violin flourishes along with some very Peter Buck guitar work. 'Such A Simple Plan' is another perfect three-minute pop song with excellent lyrics and a toe-tapping quotient that can't be beat, and final track 'Last Dance' is a swanky little number that will make you want to dance like Fred Astaire. Perfect for fans of the abovementioned bands, The Lucksmiths, Belle and Sebastian, The Smiths, or Acid House Kings, this is a remarkable debut that will surely rank among the best albums of the year.